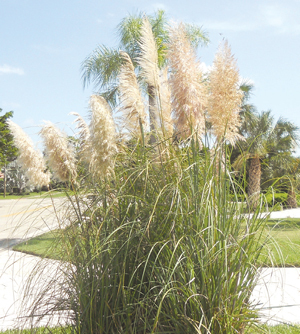 In Florida, Ornamental Grass is a category of grass that is very eye catching that does not have to be mowed. It is not turf grass. With its large number of species it’s easy to find ground covers, shrub plants and also tall plants to fit almost any landscape need. Grasses usually can make any landscape more interesting and give it a very tropical look. There are many varieties to choose: from low growing to shrubs to very tall. Ornamental grasses include true grasses but also bamboos, flax and sedges. 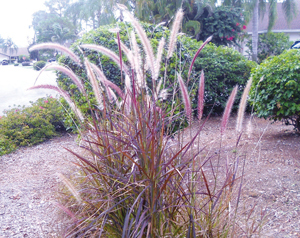 Like most plants here in Florida the grasses go through flushes of growth all year long. Ornamental grass should be pruned down in late winter or early spring to ensure beautiful foliage almost all year long. The warm weather here in Florida help these plants germinate quickly, so keep an eye out so that you can control their spread, just like you do for most plants in Florida. Bamboo species that grown here in Florida are of tropical nature, that are clumping varieties. Avoid bamboos that are running in nature for they will take over the world in a blink of an eye. 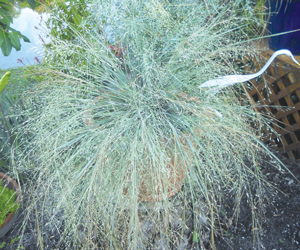 (Tripsacum dactyloides) is one of the most tropical looking grasses we have, growingsix feet tall and wide. It grows in full sun to partial sun and has dark green leaves with tall arching tan spikes. It is drought tolerant but not salt tolerant, so if planted as a littoral plant, the body of water needs to be fresh. In the past couple of years they have come out with a dwarf variety that will get three to four feet tall. Sea oats (Uniola paniculata) are seen up and down our beautiful beaches, its primary function is to hold the sand in place for erosion control. Wheat seed heads can get up to six feet tall. Being where these are usually planted, it can take the harshest conditions such as salt, high winds, bad soil, drought and full Florida sun. Muhley Grass (Muhlenbergi capillaris) is one of my personnel favorites. 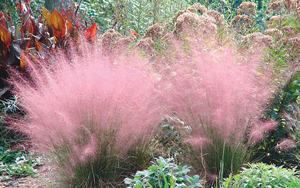 Planted in mass, the purple haze their plumes give off in the fall and winter is mesmerizing, especially when the sun highlights them. This native grass can get about three feet tall and tolerates salt, cold, drought and cold weather. Some great examples here in Naples are on the center medians of Golden Gate Parkway and many others. Red Fountain Grass (Pennisetum setaceum) Red to burgundy leaves and plumes reach heights of six feet with this grass. There is a Rubrum compact species which only grows one to two feet in height. It is drought tolerant and will even take a frost. Planted in masses or as a container plant works. Bamboo Muhley (Muhlenbergia dumosa) is my favorite. It resembles a bamboo having multiple shoots. It can reach seven feet but has a weeping habit with a very fine and feathery nature. Even with its fine lacy over all look, it is a tough plant. It loves the heat and looks great in raised beds. The Naples Botanical gardens has some of the most beautiful I have ever seen. Lemon Grass (Cymbopogon citratus) is fast growing with sharp, long green leaves growing up to six feet. It has a lemon scent and is even used in tea and Asian cooking. Even though this grass is clumping, it will seed itself everywhere. Keep on top of this one or else it will be on top of you. This one needs open areas. of up to seven feet. 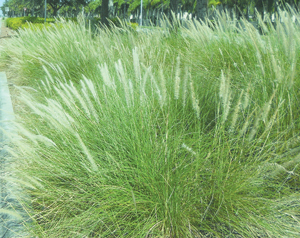 One of the showiest plumes of all ornamental grasses, its large and pure white. This grass makes a specimen plant for any garden. It does have razor sharp leaves like the lemon grass. I have only seen a few here in Naples with its beautiful white plume and they say there is a pink species. In Bermuda, Pampas grass is everywhere. Maybe it’s time for a vacation in search of the pink variety. Last time I was in Bermuda was 32 years ago on my honeymoon. Blue Love Grass (Eragrostis elliotii) Leaf blades are blue in color and slightly weeping. Love grass will get maybe two feet high and wide. The color is amazing in this clumping variety. One of the low growing varieties requiring full sun and is drought tolerant. Sand Cordgrass (Spartina bakeri) is at its best when planted in mass on margins of retention and detention ponds, It grows fast and is great for filtration. The native cordgrass is an aggressive spreading plant that will accept wet feet but it is also drought tolerant and has good salt tolerance. – wet or dry. Also, when planted on the margins or littoral plantings, they filter the runoff from our lawns and acts as a buffer and filter before it infiltrates the pond water. In my opinion, it would make our retention ponds a little more eye appealing than the lunar landscapes we are used to looking at. These are just some of the many ornamental grasses we have in south Florida but I am sick of typing so do a little investigating on your own. The hunt can be best part of the find. It is not a native Florida plant, as it’s origins are Africa and the Middle East. It is however drought tolerant. Warning: It can re-seed and spread out to become more plant than you bargained for. Allow enough space for this and/or remove wandering new grass sprigs that pop up nearby.